The smiling café manager at Snape Maltings asks us if we’re absolutely sure we’d like cappuccinos. Wouldn’t we prefer something cold in this heat? An ice cream, for example? They have an excellent range of ice creams. Outside, a sea of green stretches across the Suffolk wetlands and a light breeze makes a cappuccino a viable option while the murmur of waving reeds and Britten’s Fanfare for St Edmundsbury wafts through the open windows. Somewhere out on the boardwalks, two euphoniums and two trumpets rehearse to an empty sky. Aldeburgh Young Musicians (AYM) and Britten Sinfonia Academy (BSA) are two of the most exciting, challenging and diverse opportunities available to outstanding young musicians from across the east of England. Both organisations help to shape the musicians of tomorrow bringing together like-minded people to rehearse, perform and exchange creative ideas. Over a series of residential courses encompassing an extraordinary range of musical ideas, approaches and genres and led by the most exciting artists from every walk of musical life, the AYM programme is an explosion of creativity encouraging members to push the boundaries of what they can achieve and question everything they think they know. 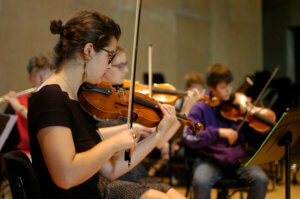 Modelled on the aspects for which its parent orchestra is world-renowned, BSA is a focused, chamber orchestral training experience in which outstanding young musicians work with exceptional artists to hone their musicianship, leadership and ensemble skills. The two organisations have several young players in common and relish this annual opportunity to bring both groups together to explore sets of complementary skills. 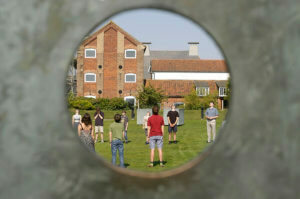 Under the expert guidance of musical director and conductor Jessica Cottis and commissioned composer Neil Tomas Smith, the seven-day combined residency encompassed a range of activity from orchestral to chamber rehearsals, composition and conducting workshops, discussion, question and answer sessions, rhythm workshops and stretching on the lawn. Mentors, selected for their broad range of professional experience and diverse approach to rehearsal and performance included Britten Sinfonia members Marcus Barcham Stevens (violin), Bridget Carey (viola) and Owen Gunnell (percussion) complimented by classical, contemporary and folk artist and long-time Birmingham Contemporary Music Group collaborator Jack McNeill (clarinet) and jazz and session trumpeter Will Smith. In a place as beautiful as Snape, process is paramount and the space and time to explore and experiment is a valued luxury. Outside the café windows, the Britten fanfare rehearsal has concluded to a patter of applause from passers-by. There’s a short break ahead of the culmination Open Session in which participants and mentors will present a selection of work from the week to friends, family and the public. 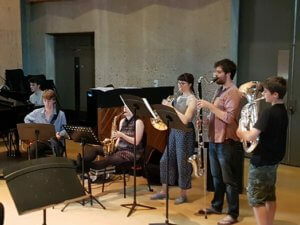 The complex and exciting programme includes new compositions by five young composers and the premier of mentor Neil’s Dreams of Fire, chamber works by Howard Skempton, Bach and Philip Cashian and Poulenc’s Sinfonietta. T-shirts and shorts are discarded in favour of concert blacks and flip-flops swapped for polished shoes. There’s a buzz among both audience and performers.